I&apos;ve finally gotten around to a new garden experiment. I love doing this, but have just been too busy to get to another one. Well, the day has come and it has already started. This plant experiment involves the use of Milorganite. Milorganite is a great addition to brugmansia, (and your other plants too) because it contains a lot of iron. Iron gives us the nice, deep green leaves we love so much. 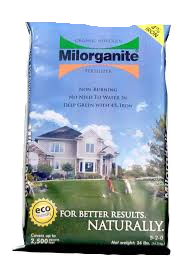 Plus Milorganite has nitrogen and other nutrients in it that also help the plant to build strong tissue. The manufacture of it has been around for 85 years, and it is used a lot as a slow release lawn fertilizer. 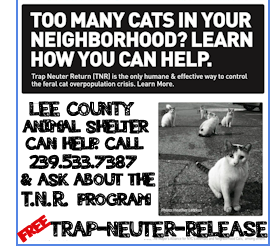 The effects last 8 to 10 weeks before re-application is neccessary. So, today is August 26th, 2013. 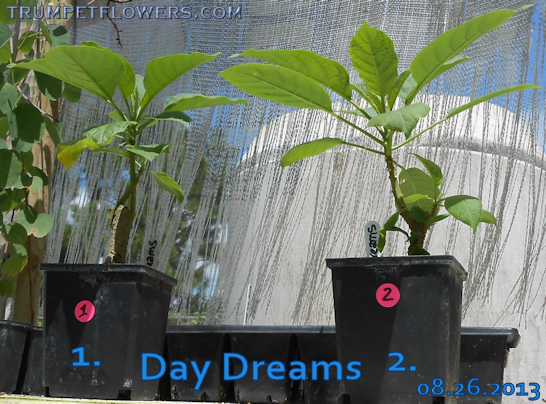 I am going to use three closely sized brugmansia cultivars, Day Dreams. These three plants are about 9 inches tall as of right now. They are all in One Quart pots. They have a great soil mixture that contains Osmocote. The soil mix itself is made up of peat, well rotted compost, (non-cow), perlite, fungal treatment flakes, and pine chips. Number 1 is to be the Milorganite Baby. Number 2 will be given no milorganite. Both will be given a foliar feed (kelp powder spray on leaves) once a week, as well as MiracleGro Tomato fertilizer. I am also currently only using rainwater for all watering purposes, as it is so abundant right now. There is also a control, number 3, which I did not take pictures of, but looks like the others. It will not receive any fertilizer, foliar feed, or milorganite, but will be watered the same as the other two. It also has the same soil mix. I will take photos and add them next week. What I want to glean from this experiment, is whether or not I will see any real differences with the use of the milorganite, or not. Will it make the plant stronger? Will it make it grow faster? What will be the differences in the root mass? And of course, those deep green leaves. I have added One teaspoon of milorganite to the top of the soil in pot number 1, and watered it in with the rainwater. Number 2 and Number 3 Day Dreams was given the same amount of rain water. Neither received any other fertilizer today. I fertilize on Sundays. All three of them received MiracleGro Tomato fertilizer yesterday. From now on, no fertilizer, nor foliar feed, for Control, Number 3. I&apos;ll take a picture next Monday and we&apos;ll see if there is any difference yet. I expect this experiment to go about the run of the milorganite, which is 8 weeks. They may need to be repotted inbetween too. This entry was posted on August 26th, 2013 and is filed under Gardening Experiments.